An all-color tour of the steam-diesel operations on the Western Division photographed by Sandy Goodrick and narrated by Jerry Pinkepank. The Korean War years found the NYC in a life-or-death struggle. Here is an all-color tour of the steam to diesel operations of the Western Division (Elkhart to Chicago) photographed by Sandy Goodrick and narrated by Jerry Pinkepank. 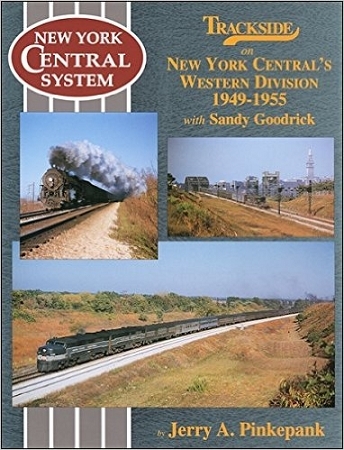 The New York Central System that Hoosier (and NYCSHS member) Sandy Goodrick experienced in 1949-1955 was in a life or death race with inflation and loss of revenue to competitors. Of all the things management could do to meet these challenges, the best weapon was dieselization. 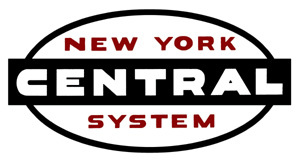 During these years, NYC concentrated the new machines on Lines East, leaving Goodrick’s western region looking like an operating museum. Many first line trains were still powered by J-3a Super Hudsons. Before 1953, Niagaras were relatively rare on the west end, but here they appear in great numbers. Contents: Introduction and Western Divn. map, pp. 3-6; Sandy Goodrick profile, pg. 7; Western Division, pp. 8-83; East from Elkhart, pp 84-98; Michigan Central Mainline, pp. 99-109; Notre Dame Football Specials, pp 110-128. Morning Sun Books, hardcover with dust jacket, printed in China, copyright 2003, 128 pgs., 8.5 x 11 x .5 in., abt. 300 color photos with captions. NYCSHS members who are signed into their accounts will enjoy pricing at 20% off retail; Ohio residents must add 8% sales tax.